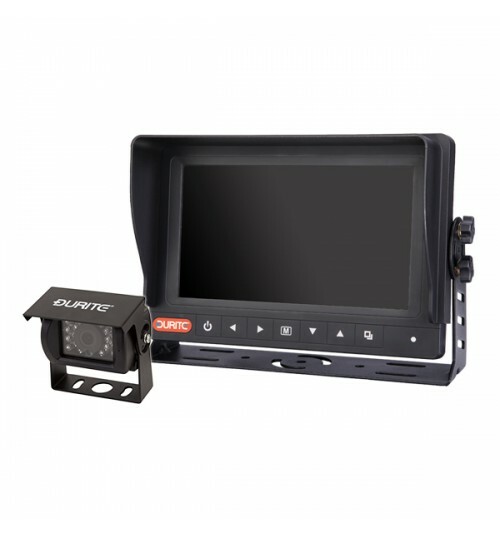 12/24V waterproof CCTV kit includes a 7 inch colour monitor protected to IP68 allowing it to be fitted in an open cab such as agricultural machinery, plant and equipment. The kit includes 1 off rear mount infra-red colour camera and a 20mtr cable. Compact size and single connection make it easy to install. The camera has a CCD image sensor which gives a high-quality picture and its solid state circuitry provides extremely long life. Automatic gain control (AGC) provides a clear image in both strong sunlight and low light conditions, if lighting conditions fall below a set level, the infra-red LEDs will illuminate. The CCTV kit is CE, EMC and R10 approved.